When close to three-quarters of us have smartphones, and at least a third of the pictures taken are selfies, here’s how to take a snapshot of self-directed kindness when times are tough. 67% of cell owners check their phone for messages and alerts even when the phone is not alerting you. 44% of cell owners sleep with their phone next to the bed so they don’t miss out on the next dollop of dopamine in the brain from receiving the “ding” of a new text or email. 71% of teens use more than one social networking site. Though I can claim ignorance around things like Instagram or Snapchat, I also find myself among the 50% of the population who have taken a selfie. From that mundane arms-reach shot of you, a friend, and the sunset at the beach, to actor Bradley Cooper’s celebrity-crammed Oscars pic, selfies and the phones we’re addicted to remind us of our fundamental need to connect with one another. And while selfies can be a way to link us up, we sell ourselves short by focusing on just the skin-deep aspect of things. What if we learned to really take selfies? That’s where mindfulness of yourself comes in—specifically, what is increasingly referred to as “self-compassion” in the mindfulness meditation world. Cue the clicking of mouses and swiping of fingers across screens to get away from such unsavory topics as the deeper, “real” you—particularly when you’re stressed and suffering in some way. But see if you’re willing to hang in anyway for a minute or two. Self-compassion is far more than chasing rainbows and skipping after unicorns. According to psychologist and researcher Kristin Neff, self-compassion is self-kindness (versus self-judgment), combined with a sense of common humanity (versus being alone with what’s hard) and mindfulness (versus being over-identified with bad feelings). Self-compassion is the picture we should be taking of ourselves and tweeting out to the world. It’s us seeing our pain as part of the larger, universal picture of being human, and seeing ourselves as worthy of kindness and care. And it’s not weak or passive, or narcissistic and self-indulgent. It takes guts to practice, and science shows that it can do much to lower anxiety, stress reactions, depression, and perfectionism. It can open you up to your life whereas your old patterns or reaction and self-judgment close you down. Self-compassion is the picture we should be taking of ourselves and tweeting out to the world. More than the time we spend on our phones, we spend far too much time in our heads—in our thoughts—analyzing, judging, belittling, and bemoaning ourselves. 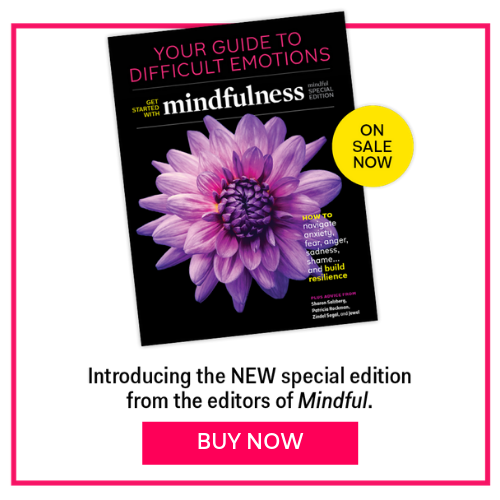 You came to mindful.org because you have an interest in mindfulness. Self-compassion is the wide angle lens of mindfulness turned about toward your own suffering. It’s time to have a good look. When you are stressed, overwhelmed or upset, take a moment to check in with yourself. Direct your attention to your bodily sensations. Where in your body do you feel this upset? Let yourself feel these sensations just as they are for a few moments. Do me a favor—do yourself (and the world) one by doing more than just reading this post. Consider putting down your phone and taking a real selfie . . .
Germer, C. (2009). The Mindful Path to Self-Compassion: Freeing Yourself from Destructive Thoughts and Emotions. Guildford Press. Neff, K. (2015) Self-Compassion: The Proven Power of Being Kind to Yourself. William Morrow Paperbacks.